Groceries account for close to half of all retail sales in the UK market. Distributors help retailers combine the benefits of high efficiency with low pricing. Retailers forge relationships with distributors well in advance for meat, poultry, and seafood deliveries. Groceries account for close to half of all retail sales in the UK market, but how do they get from suppliers to display counters at supermarkets and stores? There’s a lot going on behind the scenes when it comes to grocery logistics, especially for large-scale chains and individual stores that stock a wide range of foods. Retail grocery supplies can be classified into six major categories: ambient (or shelf stable), dairy, frozen, health and beauty aids, bulk, and wholesale. As these make their way from farms and processing facilities to grocery shelves, various online and offline channels of distribution come into play. Most retail establishments source their grocery supplies through wholesale or bulk distributors. They handle the supply of conventional or specialty items (such as organic, natural and world foods), buying directly from manufacturers and then selling to retailers. Often, larger chains have their own distributorships or purchasing groups as well. 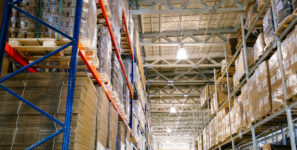 They may choose which products are kept in stock at distributor warehouses, negotiate price cuts across the board, or even buy key items directly from manufacturers. Products are typically delivered to a centralized location and then distributed to individual stores. As in any other industry, the specialized service and traceability provided by grocery distributors in the UK is crucial for retailers. For grocers, supermarkets, hypermarkets, convenience stores and even online food stores, this takes the guesswork out of sourcing quality goods at low prices. Distributors help retailers combine the benefits of high efficiency with low pricing, since they can offer bulk quantities at wholesale cost. At the same time, they also help retail grocers keep a larger variety of items in their inventory, especially specialty products that might otherwise be hard to find. If that weren’t enough, there’s also the ease and consistency that distribution networks offer. Not only are deliveries handled by a dedicated team, but there’s greater convenience in terms of inventory management, storage, warehousing and transportation too. How does Produce Get to the Store? Fruits, veggies, and other produce have a shorter shelf life than canned goods or “hard groceries” (cleaning products, cosmetics, etc.). Grocery retailers rely on local farmers and growers when certain produce is in season, sourcing fresh foodstuff from locally available sources instead of their main distributors. It is also common for retailers to build a relationship with a grower or supplier before the growing season for some crops actually begins, such as corn, tomatoes, berries, etc. They will do the same with suppliers who can help stock their shelves with exotic fruits, vegetables and nuts too. How do Meat and Seafood Get to the Store? Meat, poultry and seafood are more perishable than just about any other grocery commodity. As a result, retailers focus on forging relationships with reliable local and regional distributors well in advance, before they even plan to put these items on their inventory. Commodity meats are usually sourced from regional distributors who provide deliveries on a regular and frequent schedule. However, for branded lines and specialty meat products, local butchers, ranchers and farmers can offer greater transparency and efficiency. Sourcing groceries through a distributor is often the smartest choice for retailers. It’s rare for smaller chains or stores to buy directly from manufacturers (simply because of the quantities involved) but even large chains like Tesco, Sainsbury’s, Aldi, ASDA and Morrison’s have joined hands with professionals to improve their supply chain. Adam Palmer works as a Commercial Executive Assistant at Surya Foods, the largest online wholesale store in the UK.